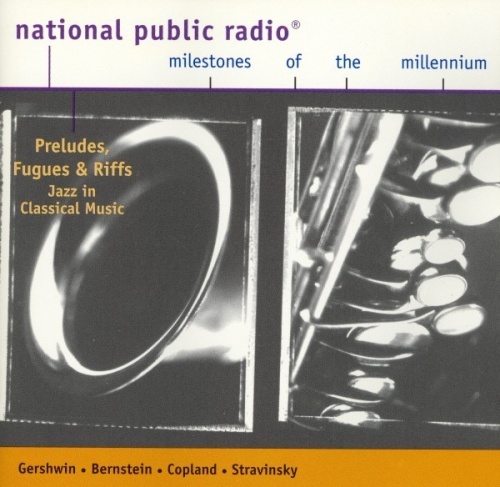 Part of National Public Radio's Milestones of the Millennium series, Preludes, Fugues & Riffs: Jazz in Classical Music pretty much explains its premise in the title, compiling portions of primarily classical pieces displaying jazz influence (although there are a few outright fusions of the two). Gershwin's "Rhapsody in Blue" is here, of course, in a piano-roll format done by the composer himself; there are also compositions by Stravinsky (performed by Benny Goodman), Copland, and Milhaud. Meanwhile, Miles Davis leads an ensemble through Jimmy Giuffre's third-stream piece "Pharaoh," and there are a couple of selections from Leonard Bernstein's West Side Story performed by the original Broadway cast. An intriguing collection all around.